42mm, 18k white gold case with alarm function, automatic movement with GMT Dual Time, and big date. It features the Ulysse Nardin patented quick set forward & backward for GMT. The alarm can be set for AM or PM time. 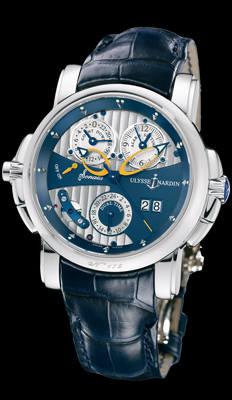 The exhibition case back reveals the 22k white gold rotor which is etched with the Ulysse Nardin name and anchor logo. Available on elegant crocodile leather strap with white gold folding buckle. Price $59,500 dlrs. Call us 956-687-2981.